Last week, I offered some tips on how to help married clients maximize their social security benefits. You probably have several divorced clients, too, who look to you for similar guidance. No doubt, divorce complicates the rules for claiming. The process of helping a divorced client claim social security, however, remains the same as with all other clients: the financial advisor's role is all about providing education and guidance. This helps your client make an informed decision as to the strategy that suits his or her personal circumstances. Your client was married to the former spouse for a minimum of 10 years. Your client is 62 or older. The benefit based on your client's own work record is lower than what he or she would receive claiming on the former spouse's benefit. Your client's former spouse is entitled to a worker or disability benefit through social security benefits (i.e., the former spouse does not have to claim benefits). In this case, your client can file for spousal benefits, even if his or her former spouse isn't receiving his or her benefits, provided that the divorce was finalized more than two years ago. Your client has the option to receive his or her former spouse's benefits now and delay receiving retirement benefits on his or her own record until a later date. This makes it possible for him or her to accrue delayed retirement credits. Your client was married to the former spouse for at least 10 years. Your client is at least 60. If your client is disabled, he or she must be over 50. If your client remarries after age 60 (or after age 50 if disabled), he or she is still eligible for survivor benefits. The maximum benefit amount that your client will receive is what the deceased spouse would have received if he or she were alive. Your client is not entitled to a higher social security benefit based on his or her own work record, however. A client who has more than one former spouse presents a tricky fact pattern, but there are still several claiming strategies available. If he or she was married to each ex-spouse for at least 10 years, your client may be able to switch back and forth between benefits. Be sure to evaluate each former spouse's work record when determining the claiming strategy. Jane is 66; she was married to Joe for 11 years and to Mike for 12 years. Joe was the higher earner, with a full retirement benefit of $2,100. Mike's full retirement benefit was $2,000. Jane's own full retirement benefit is $900. Jane began her retirement by collecting $1,050 in spousal benefits on Joe's record at his full retirement (50 percent of Joe's $2,100 benefit). After consulting with her advisor, she planned to switch to her own benefit at age 70. At this point, it would have grown to $1,188 (reflecting a 32-percent growth from delayed credits earned because she waited until age 70 to start taking benefits). Before Jane reached age 70, however, Mike passed away. He had waited until age 70 to begin collecting his own benefits, meaning that his full retirement benefit of $2,000 had grown to $2,640 (again reflecting the 32-percent growth from delayed credits). Her advisor informed her that she was eligible to collect the surviving divorced spouse benefit of $2,640, or 100 percent of what Mike was receiving. When helping a divorced client claim social security, don't be surprised if your client feels confused or overwhelmed by the complications that the situation brings. You can appease these frustrations by clearly explaining that your client—just like Jane—has many strategies to choose from to help fund retirement. 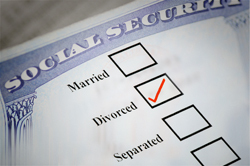 Is social security a concern for your divorced clients? How do you help them maximize benefits? Tell us below.